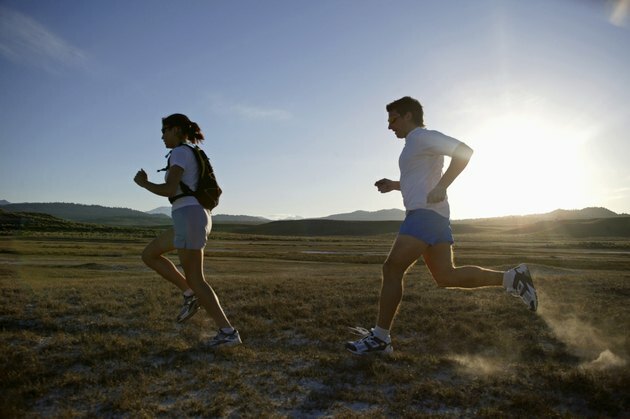 People who are very active have special nutritional needs, and runners are no exception. After a long run, you may be dehydrated or have depleted glycogen stores, and it is important to recover with good nutrition. Although most recreational runners don’t need protein shakes, they can be a convenient aid to replenish energy after a tough run. It’s simple enough to recover from short runs by rehydrating and stretching, but longer runs may require a balanced post-workout meal or snack. A protein shake can serve that purpose, especially a shake that has an optimal ratio of carbs to protein to promote running recovery. The optimal ratio of carbohydrates to protein in a recovery drink for endurance exercise is between 4:1 and 3:1, says Ironman triathlete and ultra-marathoner Brendan Brazier on the Thrive Forward website. By replenishing your glycogen stores with a nutritious protein shake, you can prevent further muscle breakdown and soreness and build toward more effective training performance. RunnersConnect.net recommends both casein and whey protein shakes. Whey can promote rapid recovery after an intense workout, and casein is a slower-acting protein that may reduce muscle breakdown while your body is resting. Think twice before refueling with a product you find on the shelf of a supplement store. It may provide the nutrients you need, but the nutritional quality of supplements can’t match that of whole foods. The International Society of Sports Nutrition recommends that all athletes get the protein they need through whole food sources rather than prepared shakes or supplements, regardless of whether they focus on endurance exercise or strength training. Creating a post-run protein shake yourself gives you control over ingredients, calorie count and nutrient composition, and helps you achieve that ideal 4:1 to 3:1 carb-protein ratio. Start with a base of milk or yogurt, which will provide about 100 calories and at least 8 grams of protein in a 6- to 8-ounce serving. If dairy isn’t an option, blend 1/2 scoop to one full scoop of protein powder with 8 ounces of water to get a protein-rich base. Then add carbs. If you use milk or yogurt, you’ll already have about 10 grams. A banana will add about 30 grams; 2 cups of sliced strawberries will provide close to 30 grams; and 1/2 cup of quick oats provides about 27 grams. Can I Drink a Protein Shake Before Jogging?